A big change in policy direction is unlikely under the next government, and opposition to euro accession and refugees will remain high. The economy will be largely unaffected. By Richard Grieveson, Peter Havlik and Leon Podkaminer. Action of Dissatisfied Citizens (Ano) won a decisive victory at the parliamentary election. The party will head the next government, with its leader and former Minister of Finance Andrej Babis as Prime Minister. The result leaves the parliament very fragmented and Ano looks set to need at least two coalition partners, which may include the far-right SPD and the Communist Party of Bohemia and Moravia (KSČM). Some other parties have rejected a coalition with Mr Babis, who is facing allegations of corruption. 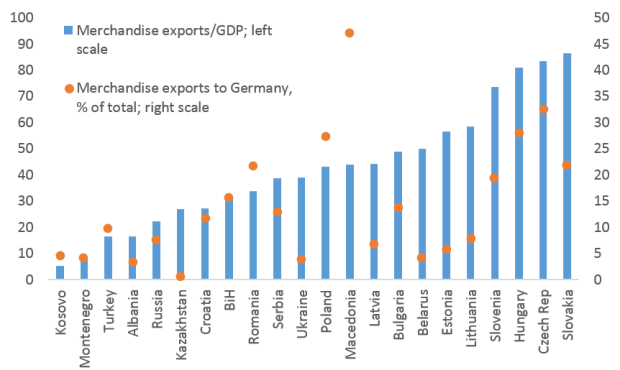 Whoever goes into coalition with Ano, the implications for domestic economic policy are unlikely to be too dramatic, although there could be a slightly more pro-business stance, particularly if KSČM is not included. The new government may cover a wide ideological spectrum and therefore be quite unstable. Foreign policy will remain largely unchanged. The Czech Republic will remain unwilling to take refugees or to join the euro; there is a broad consensus in the country on both these points. The Czech Republic’s relationship with Brussels is unlikely to become as problematic as that of Poland and Hungary. However, with EU integration efforts intensifying in Brussels and some Western European capitals, and fractious debates over the post-Brexit EU budget set to begin, there is now a greater potential for conflict between Prague and Brussels. As is usual for the Czech Republic, the economy will be largely unaffected by political developments, with growth rates set to remain strong and unemployment low, helped by robust performance in Germany. In the medium and long-term, the economy faces significant challenges, including negative demographic trends, which are already having an impact on the labour market. However, significant domestic reform to tackle these challenges is unlikely during the new parliament. The next key event to watch is the presidential election early next year. The incumbent, Miloš Zeman (an ally of Mr Basis) is poised to win, and this could impact future coalition building. Czech parliamentary elections on October 20th-21st were won decisively by the Ano (“Yes) party, led by billionaire businessman Andrej Babis. The party took just under 30% of the vote, an 11-percentage point increase compared with the last election, and around 19 percentage points more than its nearest challenger. Ano had been the junior partner in coalition with the Czech Social Democratic Party (ČSSD) since 2013. 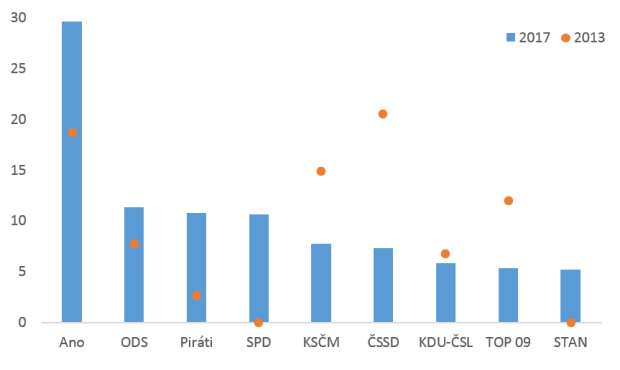 ČSSD suffered heavy losses, taking only 7% of the vote, down 13 percentage points compared with 2013, and making it now only the sixth-biggest party in parliament, largely thanks to an internal split. Figure 1: Election results. Source: Electoral authorities. The new government looks set to have Mr Babis as Prime Minister (he was deputy prime minister and finance minister from 2013 to May 2017). Theoretically, various coalition options are now possible for Ano, although some parties, including the Civic Democratic Party (ODS), which came second, and the Czech Pirate Party (Piráti; who came third) have so far said they will not enter negotiations with Ano. ODS have been in power for most of the time since the end of Communism in the Czech Republic, but have had a difficult time in the last decade. Their vote share fell from 35% in 2006 to under 8% in 2013 (in this election they recovered moderately to 11%). The new far-right and anti-EU Freedom and Direct Democracy (SPD) will be the fourth biggest party in parliament. It is likely that at least one of the smaller “populist” parties will be included in the next government, possibly together with the KSČM. The election result has generated many headlines in the international media about the success of populist parties. Mr Babis has successfully positioned himself as an outsider, despite being Minister of Finance for several years. Most of the successful parties in the election are viewed as “populist”; in the Czech context, Mr Babis is not as “populist” as many of his peers. However, our view is that the economic policy stance of the previous government will not change radically. Given Mr Babis’ business background, some tax cuts and easing of regulation is possible, although a lot of this will depend on the coalition partners. Mr Babis is thought to be considering Jan Svejnar, a highly respected US-based Czech-born economist as an adviser. In any case, the economy will remain unaffected by political noise, as has long been the case in the Czech Republic. At times during the last few years, the country’s sovereign bonds have traded inside those of Germany and even Switzerland, and such is its macroeconomic stability, export success and high foreign exchange reserves that the Czech Republic has been dubbed 'the Switzerland of Central Europe'. Foreign policy is also unlikely to change materially. Czech Euroscepticism is quite widespread (Eurobarometer polls consistently show the Czech Republic as one of, if not the, most Eurosceptic member of the bloc, although this perception has been occasionally challenged). Popular support for the euro is very low, and the sceptical position of both the government and the central bank on this issue will not change anytime soon, despite the wishes of Jean-Claude Juncker or Emmanuel Macron. Mr Babis ruled out joining the euro during the election campaign (conversely, speculation by the ČSSD’s Lubomír Zaorálek regarding euro accession a few weeks before the election could have cost the party a few points). The Czech Republic has also faced conflict with other EU countries over refugee sharing. Mr Babis has been very critical of the bloc’s migration policy (in line with the views of the majority of the population). As a result, the Czech Republic will remain one of the countries opposing the sharing of refugees. This will continue to provoke tension, especially with Brussels and countries such as Germany which have shouldered much of the burden of the 2015 migration crisis. Despite the potential for tensions with (West) European partners, we do not expect this to intensify significantly under the current government. Mr Babis is likely to be keen to maintain a certain distance from Poland and Hungary, two Visegrad states that have much more antagonistic relations with Brussels and key Western European capitals. He is a pragmatic businesman and less of an ideologue than either Viktor Orbán or Jarosław Kaczyński, and certainly less of a nationalist (Mr Babis was born in Slovakia). However, managing relations with the EU will become increasingly difficult, for two main reasons. First, the integrationist push in “core” Europe appears to be gathering steam. In this context it will be more challenging for a country like the Czech Republic to maintain its current position; at some point it may be forced to choose between integrating more with a formal “core” (including euro membership), or staying on the outside as the “core” (potentially including neighbouring Slovakia) integrates further. The second issue is the EU budget. After Brexit, the budget will be around 20% smaller than now in net terms according to our calculations. This will mean very tough negotiations in Brussels; wealthier Western European countries are highly unlikely to be willing to fill the gap in the name of “solidarity”, at the same time as many net recipients of the budget are seen in parts of Western Europe as showing anything but “solidarity” on the sharing of refugees. Although the Czech Republic is not as reliant on EU funds inflows as most other EU-CEE countries (it is comfortably the wealthiest part of EU-CEE), they nevertheless represent around 2 percentage points of GDP per year. More broadly, with UK leaving the EU, the Czech Republic will lose an important and powerful ally. More broadly, the new government will face economic challenges. At present, everything looks good in the Czech economy. Unemployment is the lowest in the EU. As a heavily export-oriented economy right next to Germany, the Czech Republic is among the main beneficiaries of the strong upswing in the EU’s biggest economy this year. The Czech Republic is comfortably the wealthiest former Communist EU member state (see below). Inequality is also very low compared to most regional peers. Figure 2: Per capita GDP, PPP, EU28 = 100. Source: Eurostat. However, the German upswing will not last forever. When the business cycle turns, the Czech Republic will be among the most affected. (It is particularly exposed to the health of the autos industry). Moreover, demographic decline—a theme across much of EU-CEE—is already starting to bite. The working age population has been falling by around 1% per year since 2010, and has contributed to the decline in unemployment. This trend looks set to continue and intensify, posing challenges for the economy in the longer run. So far, Mr Babis has not shown many signs that he will focus on the reforms that the Czech Republic needs to remain an economic outperformer in the coming years. Figure 3: Exports/GDP and share to Germany. Source: wiiw annual database.